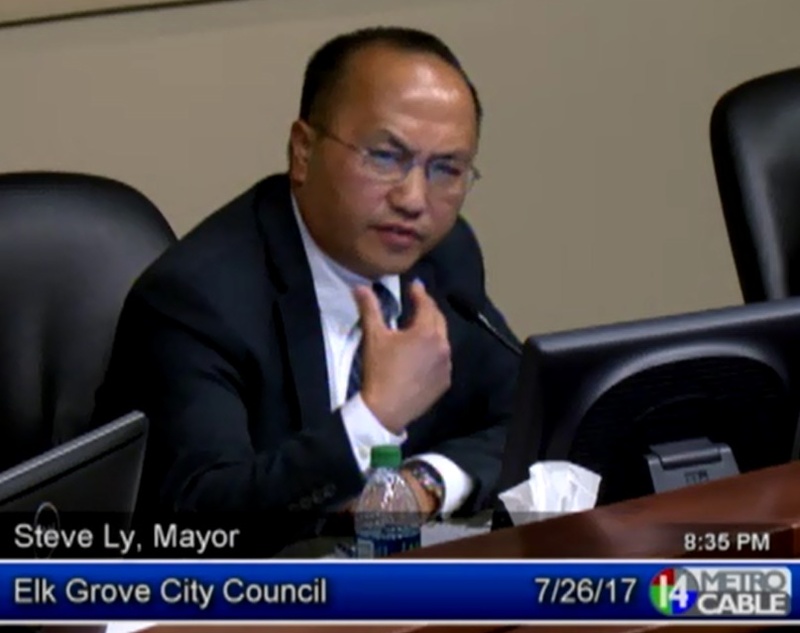 At their regular meeting on Wednesday, July 26, the Elk Grove City Council tacitly approved Mayor Steve Ly's desire to sign on the U.S. Mayor's Conference National Climate Action Agenda. The document, which has was signed by many prominent mayors as well as several in the Sacramento region, was drafted at the recent U.S. Mayors Conference in Miami. Although most mayors signed the document during the late June conference, which Ly attended, he did not immediately join the so-called Climate Mayors. After hearing a presentation from city staff, the council discussed Ly's ability to sign the document on his own accord. Leading the conversation was Council Member Pat Hume. In his comments, Hume said he was of the opinion that it was unnecessary for the council to issue a resolution and that as Mayor, Ly could act on his own. Hume also said while he supported conservation efforts and was for pollution control, which he felt simplifies the issue. "I would not want to see is us to devolve into the situation, where we, what I think amounts to little more than chest thumping and issuing proclamations and resolution about issues of national and global concern over which we have no control," he said. "I'm looking at your Berkeley [Calif.]." Hume went on to say that he feels the Paris Treaty "misses the mark." Hume said it is "self-important" to set your goals to global temperature. "Anthropomorphic climate change may well be a reality, but there is an aspect of voodoo science to it that's unprovable," Hume declared. "Dinosaurs didn't drive cars and where are they today?" Council Members Steve Detrick and Darren Suen who said they agreed with Hume's assessment of the Mayor's ability to sign the agreement without council consent. They also agreed on another aspect of Hume's comments. "I'll echo Councilman Hume's comments and express my appreciation with the Mayor checking in with us as well," Suen said. Suen went on to say that he felt Elk Grove was responsibly handling its mandated climate action plan and that he agreed with Hume's simplification of climate change. "I like Councilman Hume's arguments though, making it about 'pollution is bad'...'breathing is good,'" he said. Council Member Detrick said he was fine with Ly's participation, but went on to deride the Climate Mayors document. "It's just a paper tiger, and really, it is just political posturing," Detrick said. "I don't think we need to play politics up here." When Hume raises his “finger” to speak first, one can bet he has been chomping at the bit waiting to expound his latest rehearsed diatribe on the agenda item de jour to make sure every person knows he is the smartest person in the room. Hume declared. "Dinosaurs didn't drive cars and where are they today?" Waddya mean dinosaurs didn't drive cars???? Surely you've seen all the Sinclair gas stations in the Western and Mid-west U.S. with the dinosaur on their sign! Who do you think created those gas stations! In fact, I have a picture of me sitting on one of the dinosaurs at a Sinclair gas station in Sisters, Oregon!